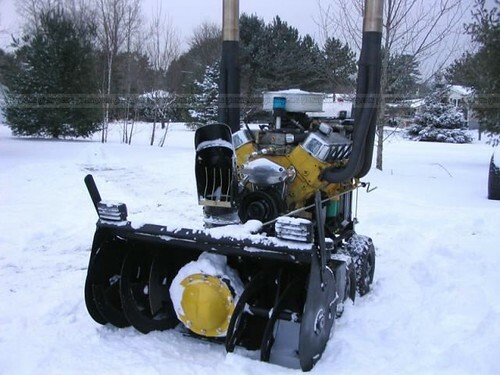 If you're tired of anemic, one-lung snowblowers with their slipping drive belts, you might consider Kai Grundt's V8 snow blower which raises the bar on the traditional snow blower in every respect. With electric start, electric block heater, antifreeze heater and eight cylinders, it has no drive belts to freeze up and you'll never get bored with the job as the 454 cubic inch big block Chevrolet V8 produces 412 horsepower, 430 foot pounds of torque and can throw snow 50 feet at just 3500 rpm. Nor will you get cold as the machine has been ingeniously designed to route the engine coolant through the handle bars, with the rear mounted, enclosed radiator keeping the operator nice and cozy. Maneuvering the massive beast (it has a total wet weight of 912 lbs) is a breeze thanks to the hydraulic-drive 4WD skid steer on independent walking beams which offers a zero turning radius. It's also as fast as you like, with an infinitely adjustable speed range on the drive wheels via dash mounted flow control. At the opposite end of the scale, it has more than enough torque to pull your car out of the ditch before the hydraulic motors stall. Adding to the well-balanced feel of the unit, just 15 pounds of down force on the handlebars will lift the auger blade off the ground in order to climb stairs/walkways for ease of snow removal. Safety has and continues to be paramount with spring return to centre "fail safe" type directional controls with emergency stop and tether cords. Safety is one of the key theme, with a flashing blue light (as required by law in many areas) being the least of the safety features. No-one will fail to hear you with those twin throaty exhausts, which come standard with 92 decibels at the controls, though if the rumble of a V8 exhaust is music to your ears, you can obviously go much louder. Even at the standard baffling, hearing protection is strongly suggested. The powerful yard machine lights and a dashboard with backlit gauges complete the package to ease the burden of this normally reviled task. The custom 42 inch, two stage auger has a Chevrolet 10 bolt truck differential with spool and a centrifugal auger clutch with shear pin protection, further adding to the image of this "automotive theme blower." As each unit is cutom-built, optional extras for the snow blower are both diverse and outrageous as the base unit - there is unlimited auger choices from single to multi stage designs and various motor combinations to suit the religious preferences of the customer (Chevy, Dodge Hemi, Ford) and such exotica as a V-10 or a diesel engine or remote starting can be accommodated. And if, after a while, you feel you've outgrown the 400 horses, this particular engine is well catered for in the performance modification area, with Lunati camshaft, Milodon Gear drive, Holley and Edelbrock components to name a few, and there's always the fuel injection option too, if you feel you need to throw the snow out of the county or ensure your seat in the "neighborhood blower blingster hall of fame."